Black tourmaline is also called Schorl. Schorl is in contrast to other tourmaline opaque and often deep black. The tourmaline has this black color becasue of the many iron compounds in this mineral. These pieces were found in Pakistan. 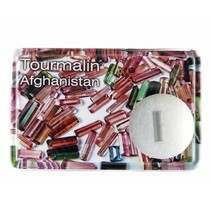 Tourmaline has been known since ancient times in the mediterranean. In Western Europe the stone gained popularity in 1703 when the Dutch took the stone from Sri Lanka. The stone was named 'Turmali'. This means in Sinhalese 'Stone of mixed colors'. Black is the most common tourmaline. Black tourmaline grounds and protects against negative energy in all of its forms: computer radiation, electromagnetic radiation, black magic, curses, stress and tension. This stone is relaxing, increases the vitality and promotes a stable situation and logical and rational thinking. Physically, the stone has a positive effect on the immune system.